UPDATE: So I decided to face fire with love. =) Check out Friends of Manila Zoo and share your stories! The basic difference between an argument and a fight: an argument, done skillfully, gets people to want to do what you want. You fight to win; you argue to achieve agreement. I’m thinking about this now as I try to find ways to nudge the online conversation about Manila Zoo towards more of an argument that builds a better world instead of a fight that pits oversimplifications against defensive reactions. It’s difficult, but I believe it’s worthwhile. Here’s the situation: People for the Ethical Treatment of Animals (PETA) and other organizations are trying to get Manila Zoo shut down. There’s a blog post with outdated pictures, an online petition, and lots of tweets and posts from people who get caught up in the cause. I know what it’s like to feel outraged and to help mobilize online opinion to beat down something. In 2005, I spoke up about a search for role models for women in IT that shocked me with its pageantry. With other people sharing their thoughts, it steamrolled into enough of a public relations mess that sponsors pulled out and the contest was cancelled – regrettably not just for philosophical reasons but also for safety, as some extremists had threatened to throw acid. I don’t stand for that kind of violence, and I’m sorry it came to that. Older now (and wiser, I hope), I wish I’d been more constructive than indignant. It can be more tempting to bring something down than to make it better, to resign something as being unsalvageable than to find the seeds of improvement in it, to be swept by the flood of reactions than to channel it into irrigating the fields of possibilities. So here is what I want to do about this outcry against Manila Zoo: I want to help shift the discussion from criticism to constructive action, and I want to help bring out the stories that flesh out the picture of the amazing place it can be. Here I confess my bias: It would probably take intentional, systematic cruelty from Manila Zoo custodians or a wonderful and funded plan for both transitioning the current zoo inhabitants to better sanctuaries and providing for reasonably-priced public animal-related education before I’d be convinced that shutting down the zoo makes sense. Having met the zookeepers, I doubt the first is possible. Being realistic about our chances, I doubt the second one is probable or that it’s even significantly better than the alternative of improving the current zoo. I’ve led a privileged life. We never had to worry about having enough money for the zoo’s PHP 40 entrance fee each. (That’s less than 1 USD.) I’ve been to some amazing zoos. But I can appreciate a zoo that public school kids can come to in order to learn that elephants aren’t just illustrations in books and that snakes aren’t actually slimy. I can appreciate having a place where families can spend a frugal afternoon. I am much more in favor of helping the zoo instead of shutting it down. I care a lot about Manila Zoo. I’ve gotten to know it better than most people have because my dad and my sister have spent so much time there volunteering. I’ve fed bananas to Maali the elephant. I’ve marvelled at the stories of my dad and my sister of the animals they got to know: how Daktari the tiger would lick my sister’s hand, all raspy; how one crocodile rose up to block another that had been thinking of attacking the volunteers; and of course, all those touching moments between children and their parents as they discover the wonders of the zoo. I have to work on keeping cynicism from gaining a foothold. Having heard of PETA’s militant demonstrations and practice of euthanasia while similar organizations manage to achieve high adoption rates, I confess to being less than thrilled with them. When people argue that Manila Zoo’s 5.5 hectares should be put to better use and that the zoo should at least be moved far away from the city, I hear echoes of other people’s concerns that these reactions are being fanned by some commercial developer who desires that land. I’m trying to focus instead on the good things in this furor: that there are many people who care, and that maybe this is an opportunity to help people turn that caring into positive action. It’s easy to say, hard to do. Easy to fill out an online petition, harder to actually visit the place and look for ways to make a difference. Easy to blame other people or the government, harder to see how you can make things better. Now, about this teasing animals by throwing stuff at them, and about the zoo animals being slow and bored-looking… Even in the best zoos I’ve been to, many animals rest in mid-day heat. The lions don’t actually sleep tonight; they sleep in the afternoon, then hunt when it’s cool. That’s why Singapore has a Night Safari. When you go to Manila Zoo, don’t expect to hear elephants trumpeting and tigers roaring. Let them sleep, and admire them from a (very safe) distance. And don’t poke the chimps, either, even if they’re doing things that may lead to awkward conversations about the birds and the bees later. Yes, part of it is because the animals could use more behavioral enrichment. The techniques for that are known – help animals play more as part of getting their food. It’s like putting Maali’s mangoes inside tires (being careful to retrieve the tire when she’s done playing with it) and freezing the tiger’s food inside ice blocks (ooh, tiger popsicles). Many of these ideas are surprisingly inexpensive. Volunteer, and you might be able to help make them happen. So here’s where we are. 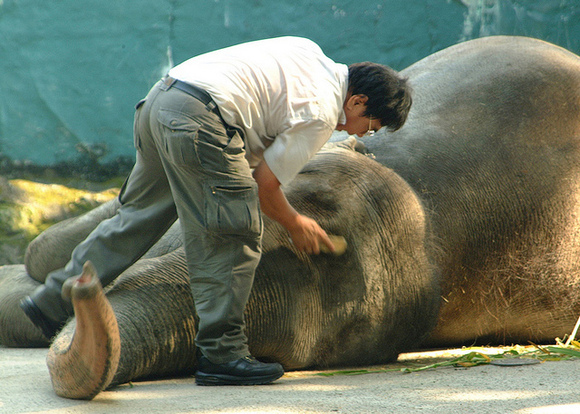 On one hand, there’s an online campaign to shut down Manila Zoo. It has a clear, visible focal point. It has sensationalistic headlines and pictures. I try to believe that people are more likely to be earnestly misinformed rather than intentionally deceptive. I heard a PETA volunteer claimed in a press meeting that Maali was fed only one loaf of bread a day. My dad pointed out that if Maali can eat all those bananas and mangoes and coconuts, surely she could afford more than one loaf of bread. Perhaps the emphasis had been on only one loaf instead of trying to imply that that was all she ate; telling the literal truth while leaving things wide open to convenient misinterpretation? Ah, rhetoric. On the other hand, there are volunteers – past and future – who are helping make a difference, and all the children and other people who have been touched by this up-close-and-personal experience with the zoo. I don’t have the skill to mobilize people in a show of support – what would it be, the “Actually, the Zoo is Okay; Yes, It Could Be Better, and Here’s Where You Can Start” campaign?” – but my dad does. He used to post a lot on the public forums of PinoyPhotography.org, but now he mostly posts on Facebook, so I’m here to bridge the gap and help get the word out. (My small contribution this week: sponsoring a Flickr Pro account for my dad and nudging him to use it so that he can share more pictures. ;) ) And it’s awesome that other people are thinking of re-forming the zoo volunteer group and helping make the zoo better. The real story is much more inspiring. I don’t want people to pick sides, I want people to make things happen: either an awesome plan for a zoo alternative, or a better Manila Zoo. So, how do we do this? We’re probably never going to be able to nudge the people who are firmly against zoos or Manila Zoo. It’s difficult for people to change what they say once they’ve taken a hard line on it, and doubly difficult when there’s face involved. Ah well. How can we show there’s value worth preserving in the Zoo, and not everyone’s calling to have it shut down? How can we refocus other conversations on how to go forward from here?